The Geology Honor is a component of the Conservation Master Award . A delta is a landform where the mouth of a river flows into an ocean, sea, desert, estuary or lake. A sinkhole is a natural depression or hole in the surface topography caused by the removal of soil or bedrock, often both, by water. Sinkholes may vary in size from less than a meter to several hundred meters in diameter and depth, and vary in form from soil-lined bowls to bedrock-edged chasms. They may be formed gradually or suddenly, and are found worldwide. an oxbow lake is a type of lake which is formed when a wide meander from a stream or a river is cut off to form a lake. They are called oxbow lakes due to the distinctive curved shape that results from this process. In Australia, an oxbow lake is called a billabong. Moraine is a French word that refers to any glacially formed accumulation of unconsolidated debris. This debris may be plucked off the valley floor as a glacier advances or fallen off the valley walls as a result of frost wedging. Moraine may be comprised of silt like glacial flour to large boulders. The debris is typically angular. Moraine may be on the glacier’s surface or deposited as piles or sheets of debris where the glacier has melted. Moraine may also occur when rocks fall in the sea. A cirque is an amphitheatre-like valley (or valley head) of glacial origin, formed by glacial erosion at the head of the glacier. Cirques are typically partially surrounded by steep cliffs. The highest cliff is often called a headwall. They are also known as a cwm in Wales, a coomb or coombe in England, and a corrie in Scotland and Ireland. A mesa (Spanish and Portuguese for "table") is an elevated area of land with a flat top and sides that are usually steep cliffs. It takes its name from its characteristic table-top shape. It is a characteristic landform of arid environments, particularly the southwestern United States. Many examples are also found in Spain, North and South Africa,Zimbabwe, Arabia, India, Australia, and the Badlands and Colorado regions of North America. An alluvial fan is a fan-shaped deposit formed where a fast flowing stream flattens, slows, and spreads typically at the exit of a canyon onto a flatter plain. An anticline on the left, a syncline on the right. An anticline is an upward-curving fold, with layers that rise from the center of the structure. A syncline is a downward-curving fold, with layers that dip toward the center of the structure. It's easy to remember which is an anticline and which is a syncline, because the syncline "sinks" in the middle. "Skjaldbreiður", an Icelandic shield volcano whose name means "broad shield." A shield volcano is a large volcano with shallowly-sloping sides. Shield volcanoes are formed by lava flows of low viscosity — lava that flows easily. Consequently, a volcanic mountain having a broad profile is built up over time by flow after flow of relatively fluid lava issuing from vents or fissures on the surface of the volcano. Many of the largest volcanoes on Earth are shield volcanoes. The largest is Mauna Loa on the Big Island of Hawaii. Mount St. Helens on May 17, 1980, one day before the devastating eruption. It is a composite volcano. A composite volcano is a tall, conical volcano composed of many layers of hardened lava, tephra, and volcanic ash. These volcanoes are characterized by a steep profile and periodic, explosive eruptions. The lava that flows from them is viscous, and cools and hardens before spreading very far. 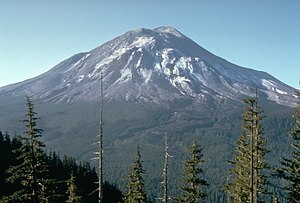 Mount St. Helens in Washington, USA, Popocatépetl in Mexico, and Krakatoa in Indonesia are composite volcanos. Ice behaves like an easily breaking solid until its thickness exceeds about 50 meters (160 ft). The pressure on ice deeper than that depth causes plastic flow. The glacial ice is made up of layers of molecules stacked on top of each other, with relatively weak bonds between the layers. When the stress of the layer above exceeds the inter-layer binding strength, it moves faster than the layer below. Another type of movement is basal sliding. In this process, the whole glacier moves over the terrain on which it sits, lubricated by meltwater. As the pressure increases toward the base of the glacier, the melting point of water decreases, and the ice melts. Friction between ice and rock and geothermal heat from the Earth's interior also contribute to thawing. This type of movement is dominant in temperate glaciers. The geothermal heat flux becomes more important the thicker a glacier becomes. Before glaciation, mountain valleys have a characteristic "V" shape, produced by downward erosion by water. However, during glaciation, these valleys widen and deepen, which creates a "U"-shaped glacial valley. Besides the deepening and widening of the valley, the glacier also smooths the valley due to erosion. At the 'start' of a classic valley glacier is the cirque, which has a bowl shape with escarped walls on three sides, but open on the side that descends into the valley. In the cirque, an accumulation of ice is formed. These begin as irregularities on the side of the mountain, which are later augmented in size by the coining of the ice. After the glacier melts, these corries are usually occupied by small mountain lakes called tarns. Sediment is any particulate matter that can be transported by fluid flow and which eventually is deposited as a layer of solid particles on the bed or bottom of a body of water or other liquid. Sedimentation is the deposition by settling of a suspended material. When water flows over a stream bed, it picks up sediments. The faster the water flows, the larger particles it can transport. As the water slows, the particles are dropped, forming a sediment. Because the water speed slows gradually, the particles are sorted by size as they are dropped. The compressional forces in continental collisions may cause the compressed region to thicken, so the upper surface is forced upwards. In order to balance the weight, much of the compressed rock is forced downwards, producing deep "mountain roots". Mountains therefore form downwards as well as upwards. However, in some continental collisions part of one continent may simply override part of the others, crumpling in the process. Block mountains are created when large areas are widely broken up by faults creating large vertical displacements. This occurrence is fairly common. The uplifted blocks are block mountains or horsts. The intervening dropped blocks are termed graben: these can be small or form extensive rift valley systems. This form of landscape can be seen in East Africa, the Vosges, the Basin and Range province of Western North America and the Rhine valley. Enchanted Rock, a dome mountain just west of the Hill Country of central Texas in the United States. In geology, a dome is a deformational feature consisting of symmetrically-dipping anticlines; their general outline on a geologic map is circular or oval. The strata in a dome are upwarped in the center; if the top of a dome is eroded off, the result will be a series of concentric strata that grow progressively older from the outside-in, with the oldest rocks exposed at the center. Many geologic domes are too large to be appreciated from the surface, and are readily apparent only in maps. Well-known regional structural domes include the Llano Uplift and the Ozark Dome. A volcano is an opening (or rupture) in the Earth's surface or crust, which allows hot, molten rock, ash and gases to escape from deep below the surface. Volcanic activity involving the extrusion of rock tends to form mountains or features like mountains over a period of time. When a river reaches a low-lying plain in its final course to the sea or a lake, it meanders widely. Sediments are deposited on the inside (convex) bank because the current there slows. In contrast, both lateral erosion and undercutting occur on the outside (concave) bank where the stream’s speed is the highest. The faster current on the outside of a bend is able to pick up sediments and transport them further downstream. Sedimentary rock is formed when sediments carried by wind or water settle and turn to stone. Metamorphic rock is formed when another type of rock is transformed by great heat and pressure. Igneous rock is formed when lava cools and solidifies. The size of a particle that a stream can transport depends on the stream's speed as well as the size and density of the particle. In general, the faster the current, the larger the particle that can be transported. As a stream slows, it drops the largest particles first. As it slows more, it continues to drop finer and finer particles. When the current stops, all sediments are deposited. In the diagram note how the sediment at the top is much finer than the sediment at the bottom. This natural sorting mechanism occurs whenever sediments are deposited, and can be used to detect boundaries between sedimentation events. A normal graded sediment indicates that the sediment layer has not been overturned since it was deposited, while an inverted bed (finer particles at the bottom, larger ones on top) indicates that the sedimentation layer was overturned after its deposition. In this photo, the wind was blowing from left to right. The left sides of the ripples have gentler slopes, while the right sides have steeper slopes. As the wind breaks over the top of the ripples, it forms eddy currents (circulating wind) which make the lee side steeper than the windward side. A gully is a landform created by running water eroding sharply into soil, typically on a hillside. Gullies resemble large ditches or small valleys, but are meters to tens of meters in depth and width. Formed as muddy sediment dries and contracts. A 'soil profile' is a cross section through the soil which reveals its layers. O) Organic matter: Litter layer of plant residues in relatively undecomposed form. A) Surface soil: Layer of mineral soil with most organic matter accumulation and soil life. This layer eluviates (is depleted of) iron, clay, aluminum, organic compounds, and other soluble constituents. When eluviation is pronounced, a lighter colored "E" subsurface soil horizon is apparent at the base of the "A" horizon. B) Subsoil: Layer of alteration below an "E" or "A" horizon. This layer accumulates iron, clay, aluminum and organic compounds, a process referred to as illuviation. C) Substratum: Layer of unconsolidated soil parent material. This layer may accumulate the more soluble compounds that bypass the "B" layer. The islands of Waya and Wayasewa connected by a tidal sandbar, Yasawa Group, Fiji.